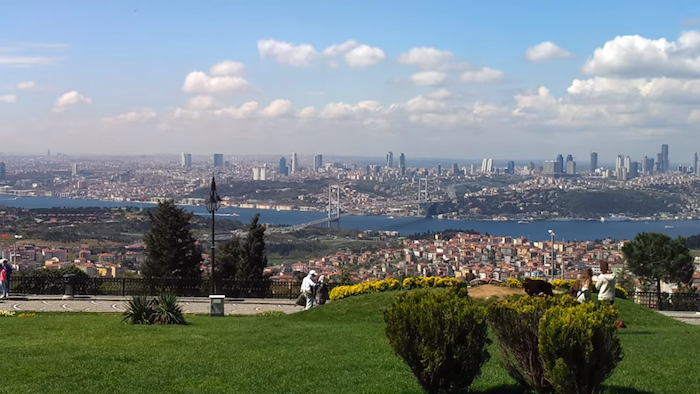 A quick run to Camlica Hill, the highest point in Istanbul, Turkey on the Asian side. It’s a nice, steady climb to the top, which features great views of the Bosphorus and Marmara Sea. The summit area is a park, featuring a viewpoint, a picnic area, a few small trails, and cafes, surrounded by pine trees and flowers. There are actually two hills: Büyük Çamlica” and “Kücük Çamlica, at 227 meters. The main road to the summit, featuring wide sidewalks, is called Turistik Çamlıca Cd. In terms of routes, there are a few options. We’ve mapped out a route from the Kısıklı subway station, taking Kısıklı Büyük Çamlıca Rd. up, doing a tour of the summit area, and then down Turistik Çamlıca Cd. This loop is ~3.8 km (2.4 miles). For a longer route, take Kısıklı Cd. west to the small Millet Park, which adds another mile or so there and back. Or, start your run at the Atik Valide Mosque for a good landmark, which makes the route nearly 5 km one-way to the hill. Short: 3.8 km (2.4 miles). Longer: 5.6 km (3.5 miles), includes jaunt to Millet Park.